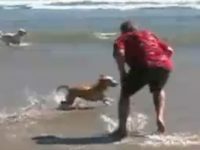 The Dog Beach Boogie is Just for Fun since we spend so much time learning it’s time to take a break and enjoy this video. This guy is really into his song. I know you will be able to relate whether your dog goes to the woods or to the beach with you and his or her buddies. Enjoy the visuals but also pay attention to the words of the song. So real dog lovers here. So sit back, relax and enjoy the Dog Beach Boogie. Now wasn’t that cool! The Dog Beach Boogie is Just for Fun and a lot of fun it must be for sure. I think they are probably just missing the barbecue however but how much fun do you think this is for those dogs. Wow!